Giant tent hosted the largest Shabbat meal ever. 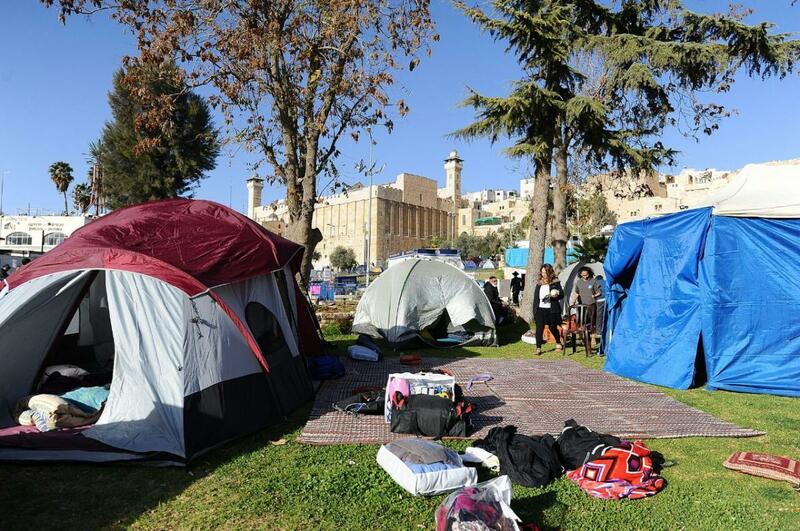 More than 30,000 people visited Hebron for Shabbat Chayei Sarah including 3,000 people who dined together at the world's largest Shabbat meal at a huge tent sponsored by Chabad of Hebron near the Tomb of Machpela. Rabbis, Members of Knesset, and public figures spoke at a series of lectures, discussions, and classes in neighboring Kiryat Arba and Hebron. Record-breaking numbers of inquiries were received this year as space ran out with 5,000 more people contacting the Jewish Community of Hebron for accommodations. Guests stayed in residents' homes, schools, hostels, yeshivot and seminaries. Countless of tents and trailers were set up throughout the communities. On Saturday morning, a huge kiddush was held with noted local residents, important Chabad emissaries from Israel and abroad, including Rabbi Yitzchak Kogan who came from Russia. Elected officials in attendance included Minister Zeev Elkin, Minister David Azoulay, Minister Gila Gamliel, Deputy Minister Eli Ben-Dahan, Member of Knesset Moti Yogev, MK Bezalel Smotrich, former MK Orit Struk, chairman of Bnei Akiva Rabbi Haim Druckman, Prof. Elisha Hess, attorney Yoram Sheftel, singer Dudu Fisher, Deputy Mayor of Jerusalem Hagit Moshe and thousands of guests from around the world, especially from the United States. The tent and meals were provided by a generous anonymous donor featuring a 5-star banquet. The entire project was a collaboration of the Jewish Community of Hebron, Chabad of Hebron, Hebron Hospitality and other entities in the region. Director General of the Jewish Community of Hebron Uri Karzen stated, "how exciting that after 50 years since the liberation of Hebron, we see the masses who came to connect to the city and the ancestral homeland." Rabbi Danny Cohen, head of Chabad of Hebron spoke at the entrance to the tent calling it a great privilege and drew a parallel to Abraham's tent in Biblical days which was in the same city and offered the same traditional hospitality. "I can only hope that we will increase every year in hosting this important event," he said. Tour of the H2 section of the city were conducted by Midreshet Hevron - Hebron College, including newly discovered archeological remains. A lecture series in honor of the upcoming 50th anniversary of the liberation of Hebron from the Kingdom of Jordan were held. The Hebron Fund USA program attracted over 300 people who participated in exclusive tours, VIP meals and housing. Registration for all programs closed out a week before the event. Past participants of the Hebron Fund program said "this was the best Chayei Sarah ever." A new attendee said it "was the best Shabbat of my life" and several excited people asked - "how am I going to go a whole year after this incredible Shabbat"? The schedule on this year's mission was jam-packed. On Thursday the Hebron Fund toured the Arbel date factory (complete with a delicious tasting), Casa el Yehud Jordan crossing, and a daytime/nighttime ATV adventure. On Friday the group jeeped from the Inbal Hotel in Jerusalem, through the beautiful Judean desert, all the way to Hebron. Shabbat in Hebron was the highlight. The group prayed and dined together along with rabbis, Members of Knesset, and top IDF brass. The Hebron Fund toured new projects across Hebron, and had quiet time in the massive Tomb of Machpela complex. Rabbi Daniel Rosenstein, executive director, of the Hebron Fund stated, "I was honored to present to the Brigadier General and the Commander of the Hebron Brigade, handwritten notes from students of the Hillel Torah Day School of Skokie, Illinois. We danced together and mutual appreciation was felt both by donors, commanders and soldiers. This year we added a Saturday night BBQ event in honor of the soldiers that was a truly awe inspiring." On Sunday, the last day of the mission, the group participated in a 5-hour counter-terrorism training program at Caliber-3 followed by dinner at the Roza restaurant in at Gush Etzion junction. To learn more about the Hebron Fund tours visit http://www.hebronfund.org. Pre-registration for Shabbat Hebron - Chayei Sarah 2017 is now taking place. The Jewish Community of Hebron would like to thank the many people who make the event a success including the Hebron Fund , Chabad of Hebron, the Tomb of Machpela Heritage Foundation, Hebron Hospitality, and the religious council of Kiryat Arba and Amichai and Rina Ariel, parents of Hallel Ariel. Logistics were arranged by Ashi Horowitz and Shirel Bleicher. The organizers thank the security forces of the Judea Brigade headed by Col. Itzik Cohen, the Hebron division of the Israeli Police headed by Commander Maurice Chen, the Border Police Superintendent at the Tomb of Machpela led by Aviad Chetfi, Magen David Adom emergency medical services headed by Shlomo Petrover and the rest of the security and medical personnel who ensures that tens of thousands of visitors could enjoy the weekend in peace and protect residents and visitors throughout the year. Photo from Shabbat Hebron below. Some photos were taken by a non-Jewish border guard officer.